The standoff at a South African mine run by platinum producer Amplats has seen police clash with a crowd of men carrying traditional weapons such as spears and machetes. A police spokesman said tear gas, stun grenades and rubber bullets were fired to disperse an "illegal gathering" at the mine outside the city of Rustenburg. It remained unclear whether anyone was injured in the exchange. The action was understood to have been inspired by the brokering of a new wage deal at a Lonmin mine in Marikana. Striking platinum miners in South Africa have signed a new wage deal to end a five-week strike at Lonmin mine in Marikana. Lonmin workers cheered as they learned they will finally return to work on Thursday at the platinum mine in Marikana, which is 60 miles northwest of Johannesburg, with a 22% payrise after six weeks of strikes, Reuters has reported. World No. 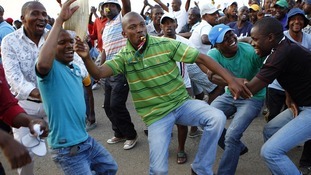 1 platinum producer Anglo American Platinum said it, too, had resumed its operations in the strike-hit Rustenburg area. South African President Jacob Zuma has estimated that the country's labour unrest has cost the industry 4.5 billion rand (£295 billion). A bloody six-week strike at the platinum Lonmin mine in South Africa will come to an end on Thursday after workers negotiated a 22% pay rise. The action at Marikana turned violent last month when 34 miners were shot dead by police in a single incident. A total of 45 people died in the unrest. Police have been firing rubber bullets and tear gas in an attempt to herd striking miners into their shacks. The show of force followed a government vow to halt illegal protests and disarm the strikers who have stopped work at precious metal mines, destabilising the country's critical mining sector.